Just when you thought you knew Hold on God is not through. He's here to walk with you There is a brand new venue. 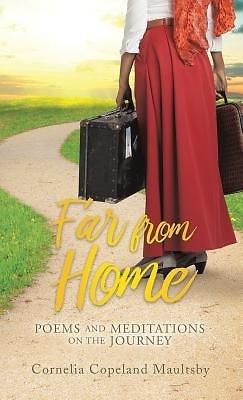 Stand on His platform Be you transformed... Far From Home is a collection of poems and meditations from years of journaling through personal experiences; expressing trials, tribulation, peace, joy, and healing, that transpired on the journey. Emotions are pushed through the soul and pain released in the secret closet. A voice of boldness arises and speaks. Using pen and paper, true beauty and strengths are revealed and forgiveness overshadows hurts and shame. Everyone should know his or her self-worth. Understanding, self-worth is not defined by failed relationships, setbacks, or setups. This book is inspirational and instructional, conveying changes that are made not because of what the enemy says but because of who God is. Cornelia shares some pit stops as she travels, exploring love, loss, pain, revelation, and restoration. On the road to transformation, truth prevails. Vision and destiny become clearer and vital lessons are learned which include: God has a purpose for your life not predicated on the past Life is not over because of bad choices, changes, or circumstances You are chosen and equipped for your journey Cornelia Copeland Maultsby, is an ordained Minister, Bible teacher, anointed speaker, author, a gifted conference coordinator, and entrepreneur. She is also the founder of CHAT Book Ministries. This ministry encourages wholeness through Scripture based books, God's written word, and relationship with Christ. It continues to grow, bless and enrich the lives of those who are connected as they seek to learn more about God's will for their lives. She resides in Haines City Florida, where she is an active member of the Parkview Christian Life Center. She can be reached at www.cnetemaultsby.com.